SerialMagic Professional is a useful piece of software that can make any application barcode-enabled. It connects to barcode scanners and transfers serial data as keyboard input so it can be inserted into any software that supports input from keyboard. 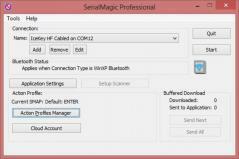 SerialMagic Professional comes with a wizard that simplifies the process of defining a connection. You will need to select the method through which the scanner is connected to the PC – through Windows Bluetooth, Bluesnap USB, or via a Wi-Fi or wired connection. Also you will be required to choose a port name for the device. Alternatively, you can perform manual setup and once the connection has been configured the app will place the barcode data from the scale or scanner in the selected field. Store a copy of all your banking and credit card transactions on your PC.